Red Elderberry (Sambucus racemosa) -- Let your light shine! Raise your vibration by connecting with multidimensional Guidance and embodying your Higher Aspects. I AM Light, your true Being, radiating through daily life. 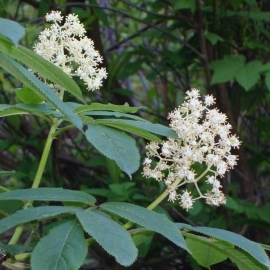 Red Elderberry is a fast growing US Pacific Northwest native deciduous shrub that grows to 18 feet tall. White flowers form in clusters turning to red berries. The berries are edible for wildlife but can be poisonous to humans when raw. Berries that are cooked and seeds removed make good jelly and syrups. Grows quickly in forest edges, clearings or newly disturbed sites that are moist or wet. It is an excellent shrub to attract birds for viewing. Rapid and deep change is happening to the Earth, many governments and cultures, and our bodies. It is easy to feel discouraged, fearful, unsafe or cut off from our spiritual connections while we adjust to this process. Red Elderberry Flower Essence strengthens the connections with your higher dimensional guidance, such as angels, spirit helpers, and your Higher Self. Many people are beginning to remember that some of these Guides are actually aspects of their Oversoul that function on higher frequency dimensions. These higher aspects assist each of us - the aspect of the Soul-self on the Earth 3rd dimensional plane - to live this life. As we each become more conscious of our Higher Dimensional Guidance, we resonate with feelings of being happy, safe, a part of more than this physical body. As you retrain your mind and emotions to live this way, your physical body will become healthier. Red Elderberry Flower Essence is a valuable ally in this process. Red Elderberry Flower Essence was made by the no-pick method of working directly with the plant spirit. While the essence was being made a matrix of amber, azeztulite, clear apophyllite, danburite, drusy quartz, icosahedron quartz, Lemurian seed crystal, moldavite and stibnite crystals were placed among the plants with the storage (mother) bottles. The sun acts as a transformer to step down spiritual energies from higher dimensions. While the essence was being made, Amber acted as a lens to receive and focus sunlight for this purpose. It also aligns the subtle bodies with the physical bodies, transmutes negative energy into positive energy, and emits a sunny and soothing energy that calms and enlivens the disposition. Azeztulite facilitates connecting and resonating with the Nameless Light. From this connection you will gain a greater wisdom and understanding of who you truly are – a being of Light. Then Azeztulite encourages you to bring this Light into the world. Clear apophyllite is a powerful ally for tapping into your inner vision and spiritual connections, such as angels, Guides, your Higher Self and your Soul. It instills an open pathway to the Light to receive courage and purpose during dark times. Danburite increases communication with angels and other high frequency beings. It facilitates embodying resonance with the Divine Heart, so you may be of service by bringing this energy to the world. Drusy quartz helps to energize and stabilize your subtle bodies. Icosahedron cut quartz has 20 (5X4) equilateral sides. It is a bridge between the 5th Dimension - the entry into the unified Spiritual realms - and the 4 cardinal directions (N, S, E, W) on Earth. Lemurian Seed Crystal embodies the soft loving energies of the angelic and cosmic realms. Moldavite formed as part of meteorites that fell to Earth more than 15 million years ago. It serves the inhabitants of Earth by facilitating strong, clear, and direct interdimensional interconnectedness between your consciousness and the higher planes of Light. Stibnite invites Spiritual Light into your physical body, completes your energy circuit with the Earth. It enhances your true magnificence! While the Red Elderberry Flower Essence was being made imprints of rattle, eagle feather and spirit song coming through Diana’s voice were infused into the essence.